Our annual visit to EMB starts with a near fourteen hour journey to Buenos Airies, followed by an overnight stop and early the next morning another flight of three and a half hours to the town of Rio Grande. The guides were there to meet us and with old friendships renewed we were transferred to the very comfortable and well appointed lodge. A good lunch followed and some of the guests retired for a siesta, me, I went for a walk along the river, getting ever more excited with every fish I saw rolling in the pools. Unfortunately fishing would not start until tomorrow. The river was in good order, very low and very clear, we hoped this would not disrupt the fishing, small nymphs we felt would be the order of the day. A typical day at EMB is breakfast at 7.00am and the guides pick you up at 8.00am. You then go to your allotted beat and fish for about 4 hours, you then return to the lodge and lunch is set for about 1.30pm, followed by a welcome siesta, out again at 6.45pm and fishing again until dark at about 11.00pm. Dinner is at 12.30am washed down with lots of superb red or white wines and then off to bed. And so it goes on. The first morning did not disappoint, despite the clear low water the fishing was good, small nymphs tied on size 10,s and 8,s worked very well. A Le Cie 13ft 7in 8/9 wt rod coupled with a MMD Multi Tip Spey line was a perfect combination to give the control needed to keep the fly in the hot spots, sometimes you need to slow it down, and sometimes you need to speed it up. The MMD line enables you to keep in touch with the fly by mending either up or down stream, without doubt an excellent line for the job. The last two seasons at EMB we have been confronted with high and sometimes very dirty water, so this year was a welcome change, but the low clear water brought new challenges. The fish were more concentrated in the pools, but they were not as aggressive as in higher water conditions. Some of the pools although full of sea trout were devoid of current so presentation was difficult and we had to either strip or hand line the flies to try and induce takes. 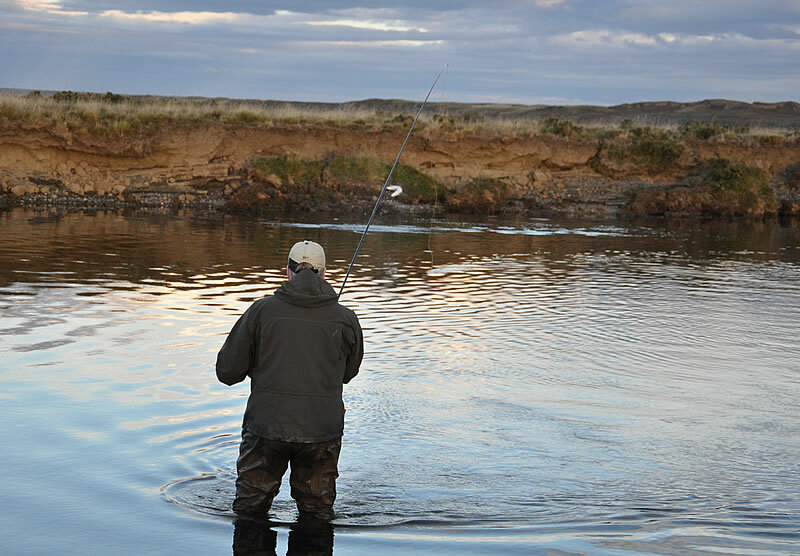 The fishing at EMB is challenging in any conditions but not impossible, the winds are almost always in a downstream direction which aids casting, but are normally very strong verging on gale force on most days, but if you keep varying your approach you can work out the technique and you will be rewarded. The evening fishing follows the same pattern, as the light starts to fade something magical happens, firstly the strong winds start to drop and for the last 30 minutes before dark, small flies are changed for large dark tubes. 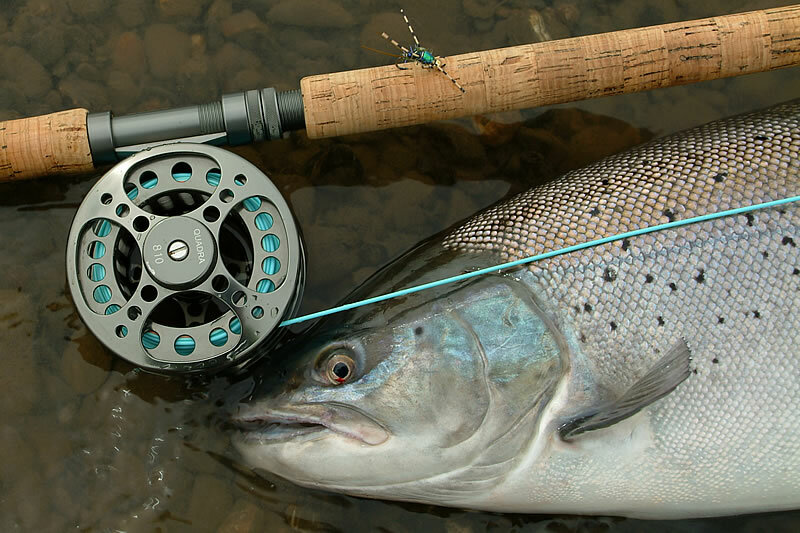 This is the most exciting time, instead of a slow moving nymph, sometimes the big flies are stripped through the pool as fast as possible, the sea trout seem to lose all their inhibitions. The takes are electric, even savage, almost ripping the rod from your hand, great excitement and heart stopping fun. In 6 days fishing I averaged 6 fish per day with sea trout up to nearly 20lbs with a near 10lb average. The guides don’t even count fish under 4 lbs These fish spend almost as much time out of the water than in it when hooked, just look at the photographs. The whole experience was alas all too soon over. 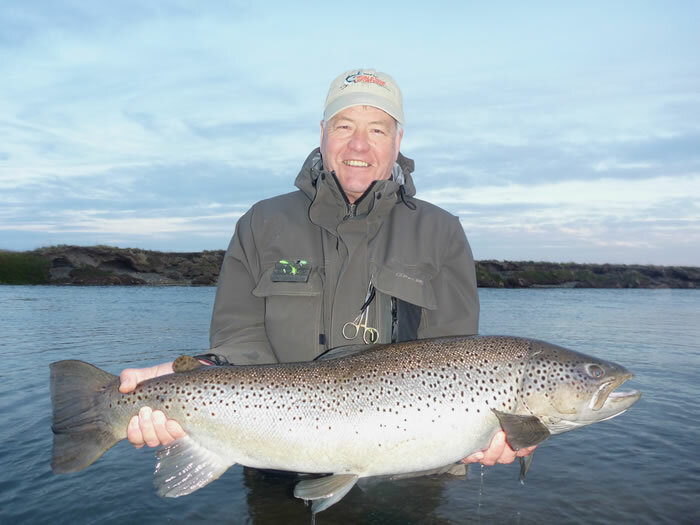 We were BLOWN AWAY with the whole experience, not only by the wind but mostly because of the fantastic fishing, some of the very best guides I have had the pleasure to fish with, they are all superb. A well run lodge with great hospitality and great food. It all adds up to one of the best game fishing destinations on the planet.